And, of course, the first Tampax AND - special for you! 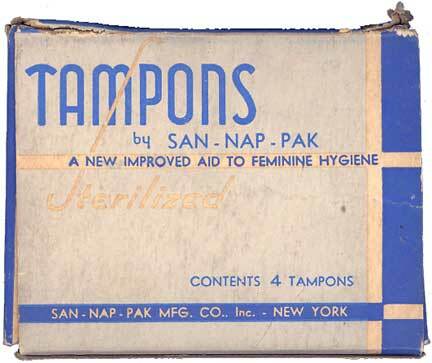 - the American fax tampon, from the early 1930s, which also came in bags. 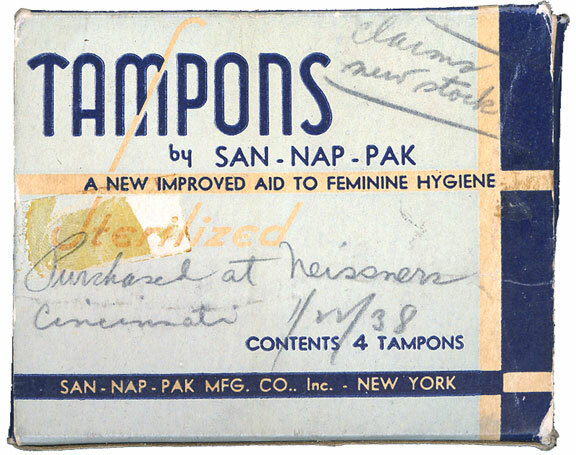 San-Nap-Pak menstrual tampon, U.S.A., late 1930s-early 1940s? I can roughly date this tampon from wording that indicates maybe the 1930s ("a new, improved aid to feminine hygiene . . . ." and "This new simple device replaces belts, buckles, pins, and any other accessories of any kind and permits the wearer complete protection with nothing to chafe and complete convenience."). Companies were emphasizing the newness of tampons. But it does use the word tampon, lacking on most earlier boxes because women probably wouldn't have known what a tampon was (you see phrases like fax's"internal sanitary napkin"). About this time a report extensively addressed the chafing problem and more; pads at the time were big (read here about the 1920s). But a second box (below) shows a written date of 1938, so my estimate was good. The box's color is close to Kotex blue, common for the early menstrual products, which the history of Procter & Gamble called "hospital blue"; Dr. Lillian Gilbreth didn't like it, as she reported to Johnson & Johnson in 1927. The Procter & Gamble Company kindly donated this tampon along with dozens of other early American menstrual devices. Harry Finley - your MUM - created the inconsistently colored scans. The box measures 3.5 x 2.75 x 0.87" (about 9 x 7 x 2.5 cm). Each side repeats the design of the facing side. "Purchased at Neissners[,] Cincinnati [Ohio] 1/22/38" and, at the upper right, a mysterious "Claims new stock." Below: The other side, in spite of what the writing says. 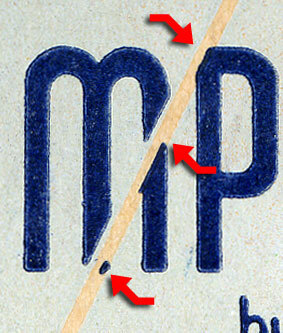 Below: On the side with the most writing (second box above) the RED arrow points to bad registration of the S and the M. The box ran through the printing press twice, the first time for yellow, then blue was printed on top of that. The top of the yellow S should have fit perfectly where the M is broken, a hard task. The ORANGE arrows point to the edges of (probably) tape that once covered a small section. 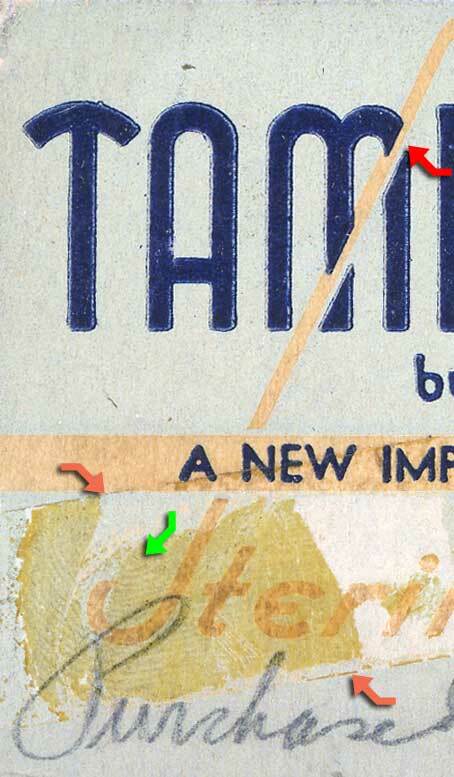 But the GREEN arrow shows something interesting: fingerprints, maybe from the person who put the tape on. 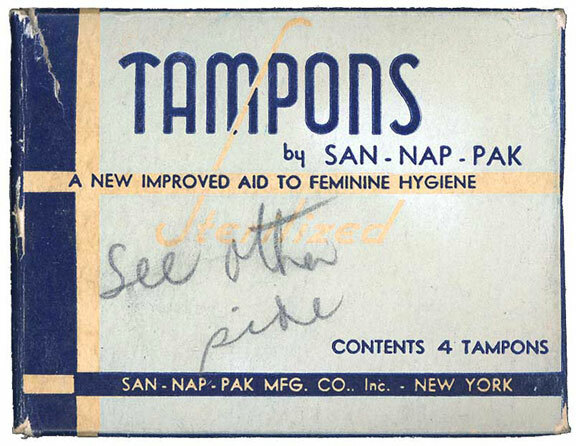 Compare the rounded top of the T with the T on a box of Tampax from France in the same year, 1938. But the A is different. Both seem to be art deco typefaces. Below: On the "See other side" side (right above) the registration misses in the other direction. And look how the S intersects the M at different points from the example at left. In both examples the blue letters had to be chopped to let the yellow underneath show. Below: The two sides and two ends are identical on both boxes. folder - tampon & bag | See San-Nap-Pak sanitary napkin ads from 1932 and 1945 and Ads for teenagers. See the roughly contemporary Cashay and Dale tampons, and very early Tampax and fax.